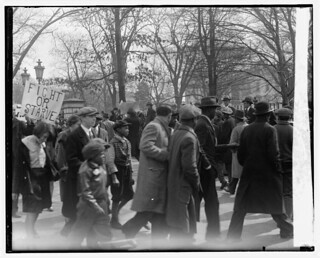 Over 100 black and white demonstrators linking arms were organized by the local Communist Party to picket the White House March 6, 1930 as part of a nationwide protest against unemployment held in cities across the country. Thousands of office workers came out to watch and were caught up in the fracas when police using tear gas and blackjacks broke up the demonstration. Eleven men and two women were arrested and about a dozen injured.